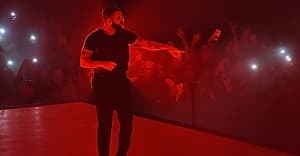 Drake’s Director X-helmed video for “Hotline Bling” has been an engrossing phenomenon since its Monday night arrival and Drake’s dad-like dance moves have been at the center of all the excitement. The video has served as the source material for hundreds of memes and mashups, with images of Champagne Papi wielding a tennis racket, and two-stepping to classics like “Suavemente”—which Drake went on to co-sign on Instagram. While Drake's moves seem almost immaculately conceived, they were delivered with the guidance of choreographer Tanisha Scott, who's brought dance moves from Jamaica into the repertoires of countless musicians. Director X was the one who gave Scott her first big break, by asking her to choreograph the video for Sean Paul’s 2002 song “Gimme the Light.” Since then, her career has ballooned: She’s been lead choreographer for many videos and tours, working with the likes of Nas, Jay Z, N.E.R.D., Snoop Dogg, Eve, and Alicia Keys, just to name a few. Scott was never formally trained to be a choreographer. Born and raised in Toronto—like X and Drake—to Jamaican parents, she relied on her culture to learn how to dance. She imitated other dancers’ moves, gravitating towards a dancehall style. “Being Jamaican is a specific style of dance, so being brought up in that, that’s what I had naturally within me. I knew how to wine, I know how to bubble,” she told The FADER on Wednesday. Once she was allowed to go to clubs, her thing became freestyling and battling, and she ended up joining a dance crew in college. Scott and X met around 2000, when they linked up through X's manager Taj Critchlow, who had seen Scott dance around the clubs, and who subsequently also became Scott’s manager. “Choreography at the time wasn’t even in my foresight, I was just so excited to dance," Scott said. "'Gimme the Light'] was the first thing I ever choreographed and it was because of [X], he challenged me on it.” In that video, Scott and X appear together. They do the log on, a traditional dancehall move. At the end of the "Hotline Bling" video, in what's perhaps the most charming among many charming moments, Scott does a similar dance with Drake. It's a loving throwback. Today, outside of choreography, Scott creative director and movement coach, contributing to Broadway plays and movies. Her most recent clients include Tina Fey, Amy Poehler, Ellie Kemper, Jodie Foster, and George Clooney. She’s worked with a slew of different directors aside from X, including Hype Williams, Chris Robinson, and Benny Boom, though she still feels she’s done her most impactful videos with X. Below, Scott speaks about the start of her career, the influence of Sean Paul on dance culture, and what it was like to advise Drake on his freestyle moves. How did you get involved with the creative conversation for the "Hotline Bling" video? [Director X and Drake's] conversation happened before I came into the picture. But then they realized that Drake wants to do a “Temperature” video, that’s what he wants it to feel—like a typical, classic X video. All the Sean Paul videos, all the major ones, were done in Toronto, so it was like let’s get Director X from Toronto. Drake, of course, major artist from Toronto. Tanisha Scott, biggest choreographer from Toronto. What “Gimme the Light” did at that time, “Hotline Bling” is doing five times over. It wasn’t expected. Drake has never had dancing, he was never dancing in any of his videos before, so if he’s going to dance, he’s going to dance in a Director X video with Tanisha Scott. That’s the way he sees it. But it was all him, it wasn’t choreographed—he was just improvising. It’s going back to the way I see things, like that’s the way we move in Toronto. It’s just free. Men and women dance and we have fun. Another point of reference for [my dance with Drake] was Pulp Fiction, when Uma Thurman and John Travolta have that little sequence. Drake pulled it up and was like, ‘This is what we should do.’ So it’s an homage to “Gimme the Light,” as well as the Pulp Fiction moment. That’s why we’re rocking out the way we were. That moment between the two of them in Pulp Fiction, their energy was so amazing. It didn’t matter what they were doing. The way Drake dances in “Hotline Bling” was natural? You didn’t choreograph it for him? Nope. That whole video, that was him. I’m on the sidelines with him, looking at the monitor and we’ll talk about it. I may give a suggestion here and there, but that’s really him, going for it. Like that’s me pushing an athlete—you gotta let them live and breathe. You may look at things and push him through it but that’s him. It was not choreographed, which is why it’s so amazing that this is what works—once you allow your artist to express himself. If they can let go from all their inhibitions to do that, it’s brilliant. That sets the bar. And look at what it’s done for him. Like you have an amazing artist like Chris Brown who is a brilliantly gifted dancer, and you just watch him in awe because he’s so awesome. But Drake is not Chris Brown. Like [Drake] can still give off a major effect from just doing him because it’s just him but they’re two separate levels. But it’s not about that. It’s about the moment you’re capturing and the energy, and getting into his vibe. That’s what people are checking into. Like, "What, he’s dancing? Okay." The fact that he’s like, "Okay, I’ma dance right now." That to me is amazing that he dropped everything and was like, "I don’t care, I’m just gonna have fun right now." That’s what it was and that’s what people are tuning into. He wasn’t intimidated, he’s not scared, he doesn’t care, that was it. It was all about having fun and the energy on set was incredible. It was a huge party on set. While he’s dancing on set, we’re all in the background having our own party too. It was definitely a mind-blowing experience—it was a lot of Torontonian pride. He also has a lot of pretty great facial expressions throughout. That’s just what he was feeling while he was dancing? He was feeling himself! As a professional dancer, I know all of those faces because when you’re dancing in a show, you got like the mean grill or a smile. It’s all about your face depending on your emotions. When you really let go, let loose, it’s like, "Yeah, I’m feeling myself, literally." You’re in the moment of it. You're widely known as the person who has introduced dancehall moves to the masses. Why do you prefer using those dance moves from your cultural background in your choreography? Because that’s naturally who I am. That’s my own self expression. I’m not trying to emulate anybody else or be any other thing but who I am, and that’s how I interpret music. That’s how I see it and that’s how I feel when I dance to it. That’s the only way I know how to present it to the world. The first time I ever did choreography was for Sean Paul in “Gimme the Light” and he is a dancehall artist, so it was fitting. I wasn’t going to put any other type of style on it. How did your dance with Drake for this video come together? [Drake] wanted to do a classic X video [for "Hotline Bling"], with the set builds and the cool performances that he had, and the main point of reference was the Sean Paul videos. So X was like, ‘Well we have to get Tanisha,’ and Drake was like, ‘Of course we have to get Tanisha.’ [Drake’s] loved my work for years. He has nothing but great respect for me. [“Hotline Bling”] was our moment too. He was like, ‘I want to pay homage to this moment, to this ‘Gimme the Light’ moment’—the one when Little X and I were at the end of the video dancing. We’re doing the log on, and that’s [the dance] Drake and I are doing [in “Hotline Bling”]. Is Drake hard or easy to dance with? Very easy, very easy. Although I wanted him to dance more with me, as opposed to [saying,] “I wanna watch you do it.” I’m like, “No, you go! Or we just go together.” It was amazing for him to want to have this moment with me, out of anybody else—”I want to have my moment with you.” That was really honoring to me and humbling. At one point while you two are dancing, you get on the floor and you’re bouncing your rear-end and he sleeps on it? Yes! That was his idea. He told me, he’s like, “You know that stuff that you do, you just get on the floor? Do it and I’ma do something.” I said, “Okay.” Literally, I didn’t know what was happening behind me. That moment has been made into five million GIFs. What do you think about all the memes people have made with pieces of the video? I think they’re hilarious, and he knew that was gonna happen. He told me, “I already know I’m going to get so many memes from this.” He was loving every part of it. After every cut, we’ll go back and look at his playback on the monitor and talk about it, and he’s like, “Oh yeah, they’re going to get me for that. They’re going to get me for that.” He called it. Drake is extremely smart and he is extremely artistic. He knew what this was gonna be, so if he’s gonna do something, he’s gonna do it 150 percent. He’s not going to do something halfway. TANISHA SCOTT CHOREOGRAPHY REEL from DIRECTOR | J Williams on Vimeo. How does it feel to be involved in something that’s both so Toronto and so successful outside of Toronto? It’s honestly an overwhelming feeling. Being from Toronto, we are very prideful and we work really hard to make our mark in this industry. To know that Director X has done it, and that I was able to do it, and that Drake as an artist has taken Toronto to a whole other level. To know that he always comes back home and knows this is where it started, this is what I love. And to know that the best of the best—he could have anybody in the world do anything for him—but to know that he knows that the best person who could do this job was Director X, and for Director X and Drake to know that the best person for this job was me, is beyond humbling and amazing. So no matter what, when you come home and do something, nothing is sweeter than doing something at home for your generation. This is the best feeling ever. Like it’s really a Canadian, a Toronto, a Six video from head-to-toe. [This video] is me. I’m a Canadian, Jamaican girl. To know that I don’t have to be anything else but who I am and the world sees that and appreciates it and loves it and gravitates toward it is the best thing, because I’m not trying to be anyone else or emulate anything. And to know that that’s what’s loved and appreciated makes it easier. It’s easy. It wasn’t difficult. Let’s put it that way. There was no part of this video where we had to think, “Okay, let’s think about this and let’s analyze this.” It was none of that. We were just free, completely free. There were no inhibitions. There were no questions to what’s right and what’s wrong. Those moments are what’s classic to Director X’s videos. It’s the moments where you can feel the record, where you can feel the artist, where you can take something back. Besides the fact that this video was aesthetically beautiful and clean and simple and grand, within that, [Drake] was just living and being himself, and everybody can connect to that. Everybody can connect to this video. That’s why Drake won and that’s why this video won. Nothing was forced. That’s why you can have these big amazing sets and it’s just him. He doesn’t need anything. And he’s entertaining.